"Welcome to the first and only «FREITAG Individual Recycled Freeway Shop». 1993 our living-room view onto the transit-bridge brought up the idea to make tarp-bags. 2006 we decide to sell our bags-made-from-tarps in a shop-made-from-containers. 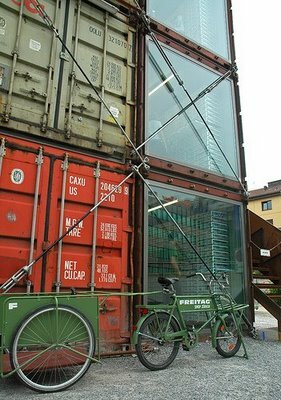 The FREITAG SHOP ZURICH is completely built from rusty, recycled freight-containers. Lovingly they were gutted, reinforced, piled up and secured. Zurich’s first bonsai-skyscraper: Low enough not to violate the city’s restriction on high-rise buildings. High enough to send shivers down anyone’s spine".